I’ve gotten my large shipment of summer reading from Amazon. I have so much that I must read during school year that when summer comes, it seems a pure luxury to me to read what I want, when I want, as slow as I want. I’ll periodically post here about books I’m reading. First up is a book on a subject very close to me. You all know that I was adopted at birth and that in 1998 I reunited with my birth mother, Barbara, after a blessedly short search. Although Barbara and I have spoken some about what it was like for her during her pregnancy with me, I really didn’t have an accurate understanding of what it must have been like for her. One book will crack your heart wide open with compassion for those women who relinquished children to adoption. 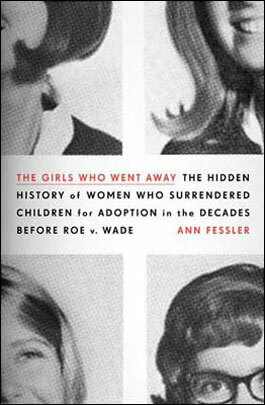 It is “The Girls Who Went Away : The Hidden History of Women Who Surrendered Children for Adoption in the Decades Before Roe v. Wade” by Ann Fessler. It’s a gripping book, every page full of poignancy, based on over 100 oral histories of women who became pregnant and placed their children for adoption in the 50s and 60s. See what The New York Times, National Public Radio, Mother Jones and other well respected journalists are talking about. The subject of favorite repeat movies, those movies that you glady watch again whenever you get the chance, recently came up on a listserv that I belong to. I had to stop and think a minute to compile my list. Gawd – my repeat movies sound so completely *gay* compared to the rest of the lists I saw. Shees – I am SO hopelessly stereotypical! What are some of your favorites, the movies you’ll drop what you’re doing to watch or that you buy for your own collection and never tire of seeing? 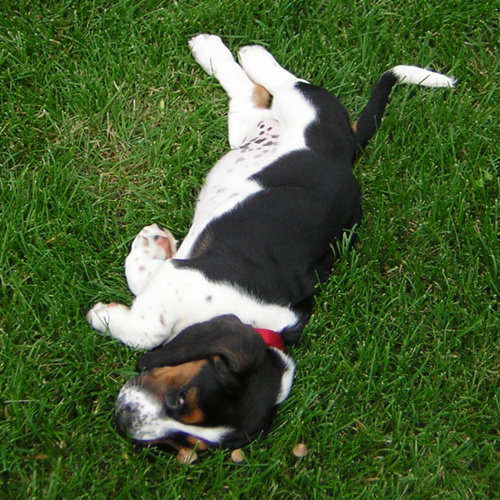 At home, rolling in the grass – she’s really good at that!! You know what fun we had picking out the name “Beulah Mae” for our little puppy, right? Well, I left out one detail you ought to know. When we got home from Iowa on Sunday and took out all the AKC registration paperwork the breeder had given us (which we didn’t bother to look at before we left Iowa), Harald immediately caught something that is almost spooky. What do you think her paternal great grandmother’s name was? Come on, take a guess. That’s right – it was Beulah Mae! Now what are the chances of THAT? Yesterday was my last final in modern European history from 1789-1949. I like this professor so much, but because of things happening around me I wasn’t able to be as prepared as I wanted to be. I think I did OK on the objective and short answers part of the final. The last cumulative essay question – I don’t know. Since the final is only 20% of the grade and I did really well on the other four portions of the grade, I’m hoping to still pull an A out of it. The last book we read and which I finished only hours before the final was Gerda Weissman Klein’s “All But My Life,” the justifiably famous Holocaust account of her years in Polish labor camps where she was spared from certain death because of her abilities as a textile worker. I always find these Holocaust memoirs a gut wrenching read, but in a way they carry a stubborn hope within them, given as they naturally would be only by those who survived. There is a part of me that feels like I have to read them to bear witness to the lives whose stories could never be told in the first person. For purely personal reasons, I identified with Klein when she wrote that survival is at once an exalted privilege and a terrible burden. I understood that feeling. All I can say is that if you haven’t read this book and have any appreciation for reading Holocaust memoirs, please pick up this book and read it. It won’t be easy, but you’ll be glad you did. There are many more. I’d suspect that you would find material at the Yad Vashem web site in their archives and in other places as well. We drove the almost 300 miles to Cedar Rapids on Friday afternoon and were both surprised by how much we loved the scenic rolling hills of eastern Iowa. We must have seen millions of square acres of corn fields – many miles of it as far as the eye could see. I had never been into Iowa further than the Clear Lake exit off of 35 where I head west to a favorite quilt store – and even that trip had been years ago. It was a delightful trip really and we especially liked the rolling hills area between Cedar Falls and Cedar Rapids. We even passed the National Dairy Cattle Congress in Waterloo and the big John Deere tractor factory they have there. When we arrived and checked in, we went for a little walk because five hours of sitting was too much. Of course, it was after 5:00 on a Friday in small town America, so not a thing was open except for bars and restaurants – and there weren’t many of them even! We especially liked see the Veteran’s Memorial building in downtown Cedar Rapids built in 1927. It sat across a long green mall from the county courthouse, built in 1923 in the neo-classic style. In between, a much smaller memorial to Vietnam veterans in red granite. It was a surprisingly moving experience and we wondered allowed at what this town must have been like in the 1920s – a hub of vital agricultural life for the area. Here is a page that has some good photo links to check out. You can see the mall and courthouse from a citycam atop the Veterans Memorial building, now the city hall. There is a large Czech population in Cedar Rapids and we were hoping to get to the Czech neighborhood to eat because we both love eastern European cuisine, but it would have meant more time in the car and we weren’t up for that. Saturday morning we got up early, ate at the breakfast buffet, and headed the 47 miles northwest to a tiny place called Center Junction. About 10 miles west of Anamosa. Between Anamosa and Cedar Junction, we passed a little, white, one-room schoolhouse that proudly proclaimed itself Grant Wood‘s first school. Do you recall the famous depression era painter known for his somewhat idealized imagery of middle-America farm life, especially the work “American Gothic” for which he is most well known? It wasn’t hard to imagine how someone who was born and raised in that area might, in the face of the severity and hopelessness of the depression, wish to offer a more optimistic vision of American life as he knew it. Both Harald and I seriously talked about making more trips to Iowa to explore more, just to travel into the little towns to see what they are like and what life looks like for the people who haven’t made the push to the big city. We picked up Beulah Mae and visited with the breeders for a while before leaving. You could tell the three small girls, one especially, was having a hard time with Beulah leaving. Eventually we waved goodbye and took off down the gravel drive and back to the highway for the long ride home. Beulah was only fitful for the first 20 minutes or so. She settled down after that on the pillow on my lap and half-slept for most of the ride home and we were both so pleased with how well she did in the car, especially considering she’s not had much car travel at all in her young life. The six hours home was a little much for her, I’m sure, but we stopped for potty and water breaks along the way and she really bonded with me – she needed to be in contact with a piece of my skin at all times. 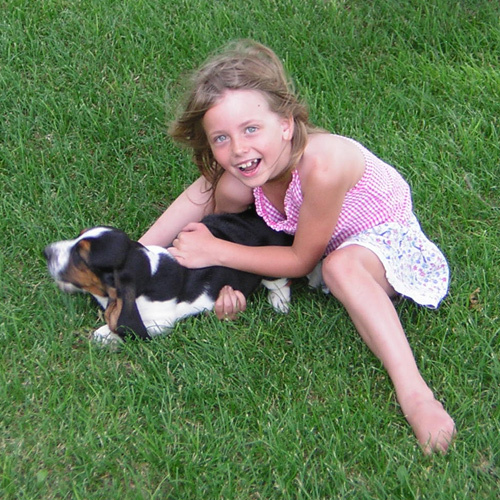 When you would put her on the grass, she would potty right away – a hopeful sign for sure. 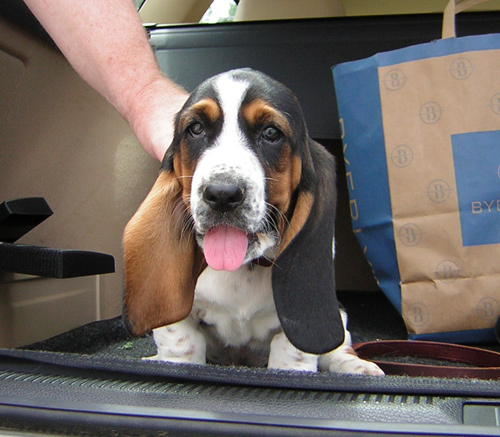 And everywhere we stopped, people would ooohhh and awwwwwe over her to no end and tell us stories of bassets they had loved. That was all very good. Saturday night she wasn’t too loud going into her kennel in the bedroom and she settled quickly for a long sleep, until she woke up at 4:00 half-crying and half-howling to be let out. I took her into the guest bedroom after Harald took her outside to potty and she curled up right next to me and promptly went back to sleep for another few hours. I was gone yesterday afternoon in class but she was calm and seemed even more settled last night when I got home. She most definitely did NOT like going into her kennel last night and I laid there for a while wondering “how long are sane people expected to put up with this racket before caving in and putting her in the bed?” She did settle down after some time and we had the same routine this morning – wake up at 4:00 a.m. to go potty, then back in the guest bedroom to sleep a while longer. Of course, I had to put her in the kennel before I left for work today as Harald was already gone – and I feel a little like the worst human in the world upon hearing her cry as I left for the day. All I can think of is a silent prayer to St. Francis to comfort her and to help her make the transition and learn that it is OK to be alone because we will always come back. But she’s been in a home with constant human companionship and play for the first eight weeks of her life so this is all terribly frightening for her I’m sure. I’ll try not to lose my mind in the process! Penstemon “Prairie Dusk” – brilliant purple color! 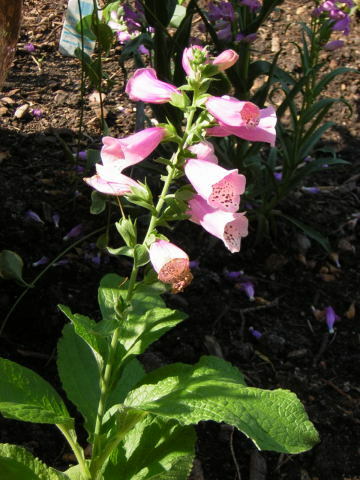 Foxglove – how can anyone resist it? 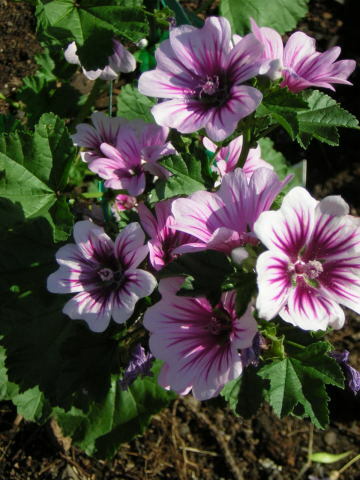 Hollyhock “Zebrina” = althaea sylvestris, a/k/a Mallow or French Hollyhock – one my very, very faves – pics to come! Evening Primrose – absolutely irresistable gossamer beauty in the palest pink! Geum ‘Borisii’ – another fantastic orange flower – why have I never heard of this before? Numerous varieties of hostas – I can’t even begin to remember them all! 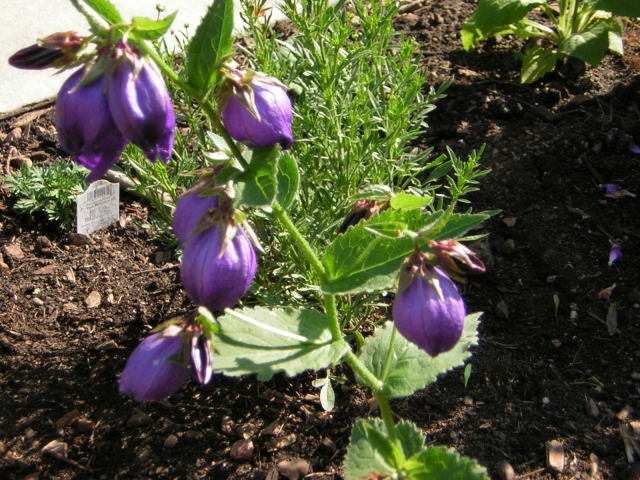 Dwarf Chinese Delphinium ‘Blue Butterfly’ (Delphinium grandiflorum) – which I’m anxious to see bloom! 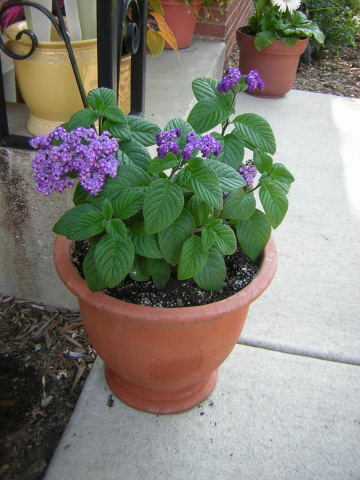 And the all-time, hands-down favorite, right now anyways, is my lovely, fragrant heliotrope (Heliotropium arborescens). Oh, how I love that smell in the garden at night as the sun is setting and the breeze is wafting its vanilla fragrance around the yard. Is that all of it? And, of course, the roses keep blooming, the tomatoes and peppers are loving the warm weather, and the basil and rosemary are gloriously out of control. 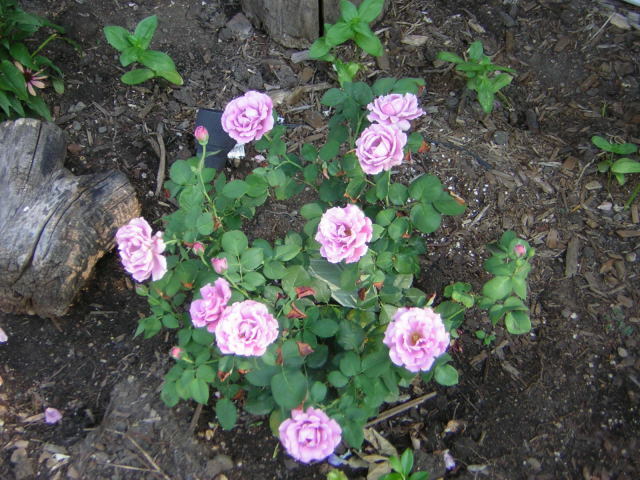 My precious angel face roses in bloom – I wish you could smell them! Heliotrope (Heliotropium arborescens) – we need smell-o-vision! 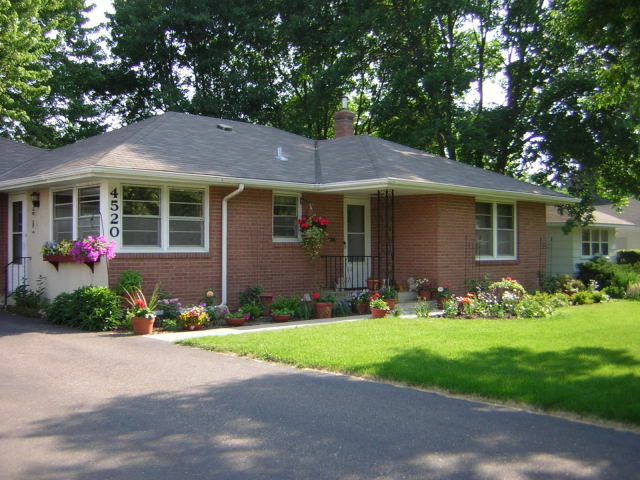 For those of you who have only seen our house in fall or winter! Jaroslav Pelikan, the noted Yale historian and religious scholar, discusses the history, purpose, and need for creeds, both ancient and modern. Poet and historian Jennifer Michael Hecht discusses the role of the “great doubters” as a positive and necessary element in the formulation of belief, religious history and human identity. I found both of these episodes to be particularly good and would encourage anyone interested in religion, history and humanity to listen carefully to each interview. I’m pretty sure we are not “designed” to accomodate as much horror and strife as is offered to us on a daily basis. I feel so, well, assaulted and nearly overwhelmed on an almost daily basis by so much ugliness in the world that I’ve been searching for ways to counteract my disgust with something that is life-affirming and positive. As part of that effort, I have decided that every day I will find at least one thing that will make me really laugh (old reruns of The Nanny are especially good for this, particularly is Yetta is in a scene) and at least one thing that I find truly beautiful. Have you seen these new Sunset echinaceas? 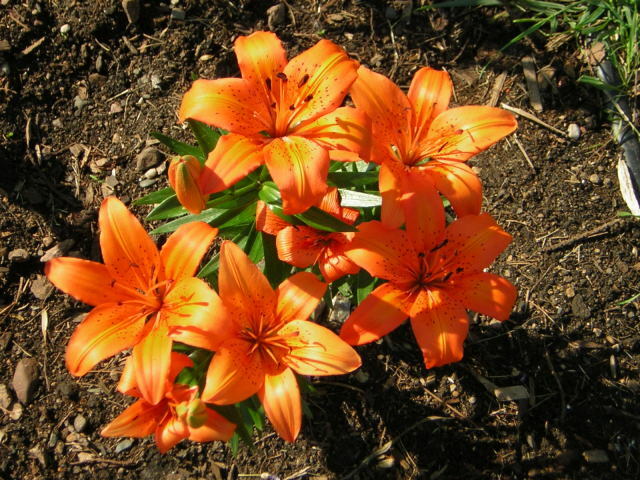 They have orange/red/pink flowers and are a surprising twist on the old purple variety. 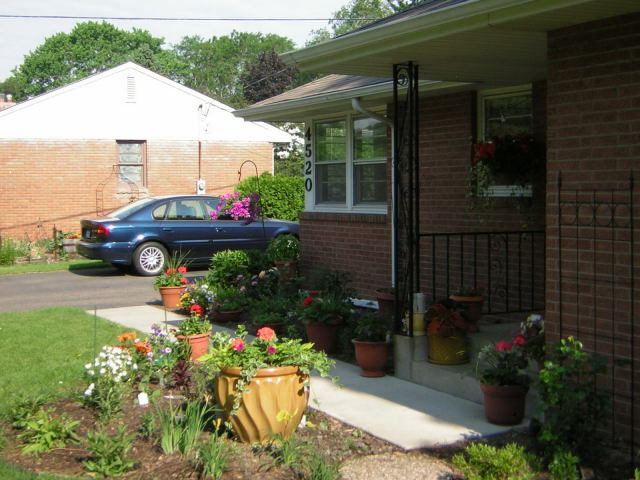 We’ve had pansies planted in three window boxes and several pots for more than a month now. They will fail soon – they can’t take the kind of heat we’ve been having. But they’ve been a joy for days and before they come to their end, I figured I had better take a picture of some of them. I love the near-riotous color. 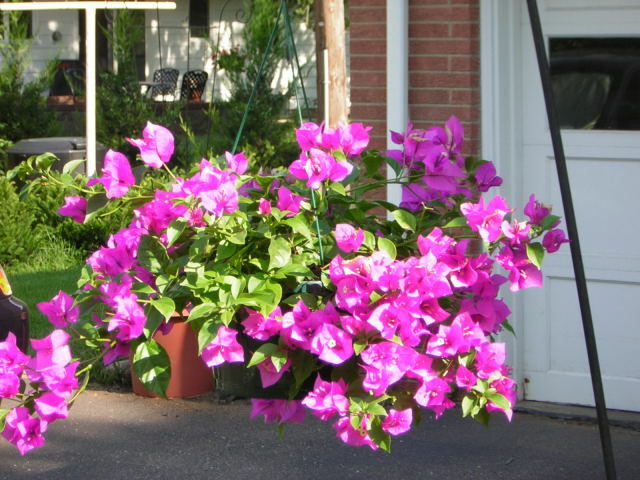 Our neighbor Margaret has this splendid burgundy clematis growing on a trellis next to our driveway. Fresh with the drops from an early morning rain, it is lovely isn’t it? !